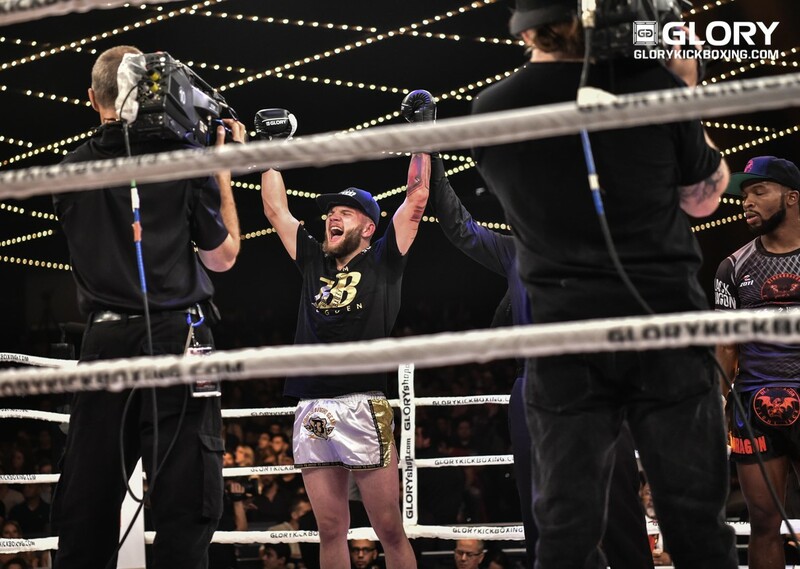 The youngest member of Nottinghamshire’s fighting Sugden family, Bailey ‘BadBoy’ Sugden, returned to the UK earlier this week after the biggest night of his career ended in a decisive win on the card of the GLORY 43 SuperFight Series in New York. Making his GLORY debut at Madison Square Garden on Friday 14 July, the 19-year old pro kickboxer was awarded a unanimous decision victory over his Thailand-based opponent Arthur ‘The Black Dragon’ Sorsor, with judges scoring the three rounds 30-27, 30-27 and 29-28 in Bailey’s favour. Asked how he felt about appearing in one of the fight world’s most iconic venues, he said: “Walking out to the ring is always a fantastic feeling. But standing on that stage at Madison Square Garden, looking out to the crowd and realising I was following in the footsteps of some of the greatest boxers in the world, was absolutely unreal. Looking back at how the fight went, he added: “When I was interviewed in New York two days earlier, I said I was there to win, to dominate Arthur in every single way, with power, with speed, with technique, with skills. Everything went to plan and I did just what I’d set out to do. With Bailey and Arthur both known for their high-level skills and good stamina, the stage was set for an entertaining clash as the two men made their entrance. Up against an experienced opponent with a pro record of 17 wins, seven by KO, Bailey played to his own strengths from the outset, taking full advantage of his superior boxing skills throughout the bout. His better handwork, evasiveness and control of distance meant that in the first half of the fight he was often able to make Arthur miss or force him to throw from further out, where the attack could be seen and evaded. Only when Bailey slowed down was his opponent able to start getting through the outer layer of defence and onto the inside, where he looked to land power shots. But faced with Bailey’s tight defensive game, Arthur found few scoring opportunities for himself. Bailey continued to dig into his bag of tricks, showcasing impressive variety as he pulled out back kicks, spinning back fists, heel kicks and more through the three rounds to add another win to his pro record, which now stands at 10 wins, two by KO, from 11 fights. “With the fight streamed live worldwide on UFC Fight Pass, Bailey’s UK followers were all able to share the excitement,” said his father, coach and manager Dean Sugden. “And later this year, they’ll have the chance to see him in action closer to home, when he’s back in the ring on Road To Glory 2.